DERescue data recovery master can easily retrieve files from format raw hard drive,format partitions or Seagate/Western Digital/Maxtor hard disk drive,usb drive/ memery card. I'm checking out your software as I have a bit of a problem... I have a NEW 250 gb Western Digital IDE drive. It has about 12 hours of Video Clips on it. .avi files mostly. Each file is probably about 25 gigs... The drive was working fine... and then we had a power outage in the neighborhood. Now the drive is seen as RAW by Windows XP. I have tried it in other computers and ran GRC Scandisk on the drive. I am certain it now has bad sectors. How can I retrieve files from RAW hard drive? What is RAW Hard Disk ? Invalid media type reading drive. Abort, Retry, Fail? File system is displayed as "RAW". 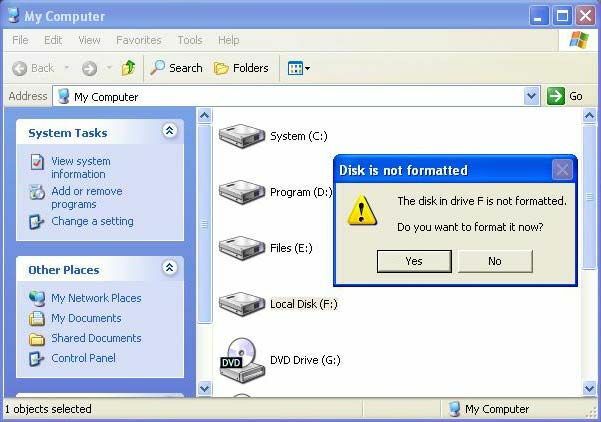 Windows may ask if you want to format the drive, such as warning "disk not formatted. do you want to format now?". Such as the follow picture. File names contain "weird" characters. " How comes RAW Hard Drive? A raw hard drive is a drive in your computer that is not formatted and that does not have a drive letter assigned to it. These must be some problem with your system, so that the system considered this drive as RAW. One of the most common reasons for accessing a raw disk is to retrieve files that were accidentally or deliberately deleted. Deleting files does not actually remove them from the disk, it merely makes them invisible through the filesystem and allows them to be overwritten at some future data when their disk space is reclaimed for new files. So here comes the possibilities that you can retrieve files from RAW hard drive. Derescue Data Recovery Master is a complete range of data recovery software for all Windows platforms and supports Undelete, Unformat from various file systems including FAT, FAT16, VFAT, FAT32, NTFS, NTFS5 on various storage media, such as IDE/ATA, SATA, SCSI, USB, Fire wire (IEEE1394) hard drive and other media such as Floppy disk, Compact Disc, USB flash drive, Digital camera, Digital audio player and so on. Please check the article of the recover steps about how to retrieve files from RAW hard drive .